I fully agree with Miki and the “people” about being hesitant to buy an expensive print-on-demand book without having seen it in person first. 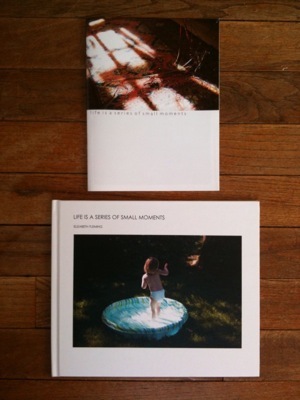 Aside from the Blurb Photography.Book.Now Meet-Ups and FotoWeek DC, there is nowhere to hold and flip through these books. I asked Elizabeth about her experiences publishing with MagCloud and Blurb, her audience for both formats, and if there is a limited edition artist book in her photobook future. 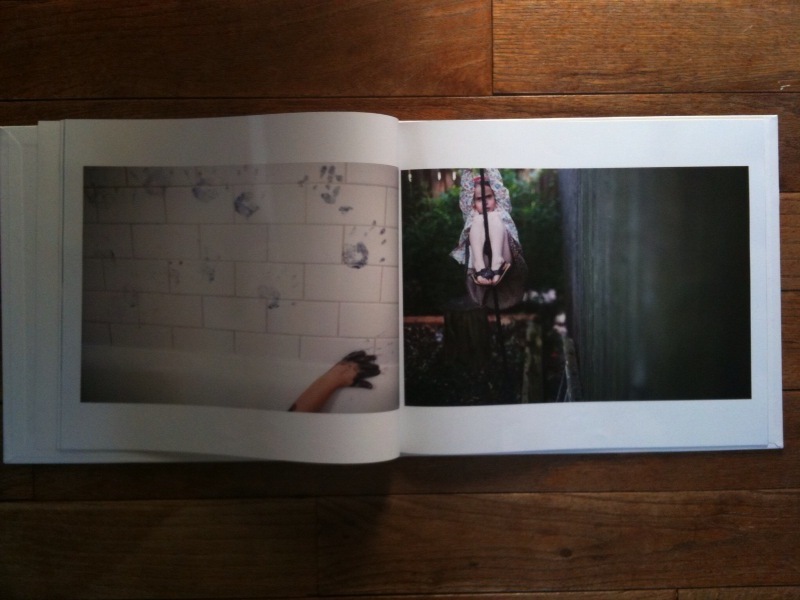 LL: Which came first – the MagCloud magazine or the Blurb book? Elizabeth Fleming: I made the magazine about a year before I made the book. LL: What was your motivation behind each of these forms? EF: With the magazine it was primarily a desire to see physically how my images would relate to each other in print format. It felt like a freeing way to experiment: because it was a magazine, and cost nothing to produce, I was able to play around without the pressure of trying to make it “perfect.” (With Blurb you have to buy a copy of your book in order for it to be listed for sale on their website.) 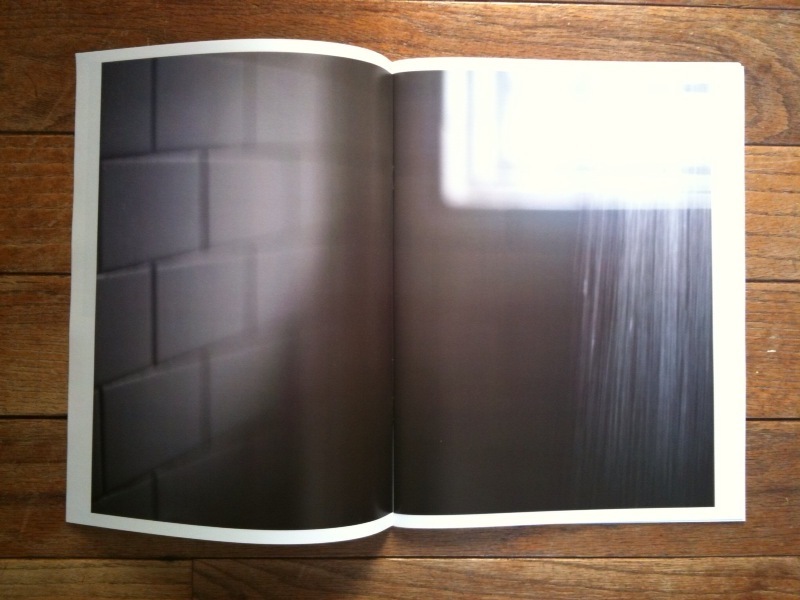 As a result I found that creating the magazine was a very fulfilling process. The book was the next step; I had kept the magazine under a certain amount of pages because I thought allowing it to become too “thick” would detract from the sense of the medium, in that it’s not as precious (even if my perfectionistic tendencies came into play in its making). With the book I was able to hone what I’d done with the magazine–I made it longer, a bit slower in the pacing, and included a dedication and statement. The size is bigger, and the format (vertical for the magazine, horizontal for the book) made it feel more polished to me as well. Obviously the hardbound cover turns the book into a more hefty object, which gives it a certain “mental” weight too, in my opinion. LL: Do you have the same audience for both? EF: I think the magazine is more accessible in general. It certainly is much cheaper to purchase. I believe people might be more inclined to browse Magcloud and potentially come across my publication by accident, as opposed to Blurb, which seems to attract a fine art-oriented base. The price of the Blurb book makes it more of a collector’s item in a sense; the magazine, at $12, is something anyone can purchase, which seems more democratic. LL: Do you use them for marketing your work? EF: I do. When I attend portfolio reviews I always bring a stack of magazines and offer one of them as a leave-behind, and I bring the book as well–particularly if I have a review with a publisher–to show as a mock-up. There are also links on the sidebar of my blog to direct people to the sales sites in the hopes of generating interest and potential income. And if I’ve met someone in the industry in a more informal setting I’ll often send a magazine along as a way to keep in touch and place a physical reminder of my images in someone’s hands. LL: Is one selling faster than the other? EF: The magazine by far, it’s not even a contest. I’ve had many conversations with fellow photographers who have also used Blurb, and the general consensus seems to be that we’ve all employed the service as a means for creating a template. In essence, when we show the book around it’s with a bit of a disclaimer: this is what my book would look like if an actual publishing house were to produce a more high-end version. Blurb is good for what it is, but the quality isn’t impeccable, I have to admit–plus the prices for purchase are extremely high. My book is over $80 and I think it’s a deterrent–if someone can buy an art book for that much from Steidl or Schilt Publishing, I don’t think they’re going to spend that kind of money on a self-published piece. Again, at $12 for the magazine, there’s no “risk”–it’s a nice way for someone to have a look at my photographs in print, but because it’s affordable I think there’s an understanding that the color isn’t going to be 100% perfect, and that the paper quality is going to be like any typical magazine for sale out there. LL: I read about the final moments of finishing and perfecting your Blurb book on your blog. Can you talk about the pros and cons of each process? EF: For some reason, despite the fact that both Magcloud and Blurb have you upload PDFs and I used the same program (Adobe InDesign) for each, I had a much more difficult time with the template for Blurb. When my PDF was uploaded I ran into a number of technical difficulties with image distortion on the cover. Admittedly, I was down to the wire because I was trying to meet the submission deadline for the Photography.Book.Now competition and therefore didn’t have much time to contact customer service, so the problems I had may have been able to be resolved more easily if I had had some wiggle room. Instead I ended up changing my cover in order to get around the glitches. Regardless, I also felt Blurb’s templates weren’t entirely accurate, whereas Magcloud’s matched up well. Otherwise, it’s not so much a pro/con situation as a different way of working. As I mentioned before, making the magazine felt freeing and enjoyable. With the book I was more emotional–I spent much more time with every aspect of its creation, and so putting it out into the world was a bigger deal for my psyche than with the magazine. LL: Have you considered making a limited edition artist book? EF: Yes, quite seriously. I think there’s a lot of room for new types of creativity to emerge through limited edition books. They have the potential to become artworks in and of themselves, with many options for being hand-bound, multilayered, or handwritten in sections, in addition to the images. One could even have a single edition for a unique one-of-a-kind piece, or a small run with some sort of maker’s mark. 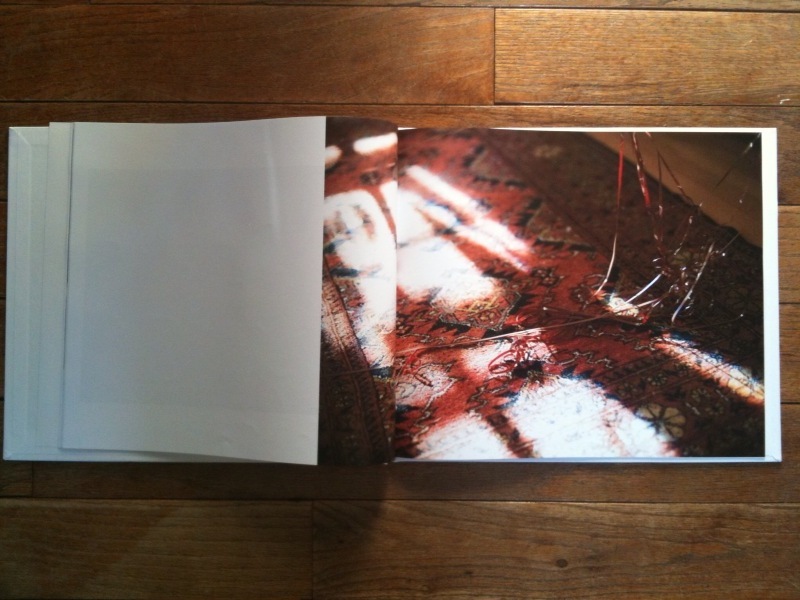 I think a more overt sense of the photographer’s hand is where the significance of the artist book lies, and will be what sets limited editions apart from the formalized self publishing industry. To purchase the magazine from MagCloud click here. 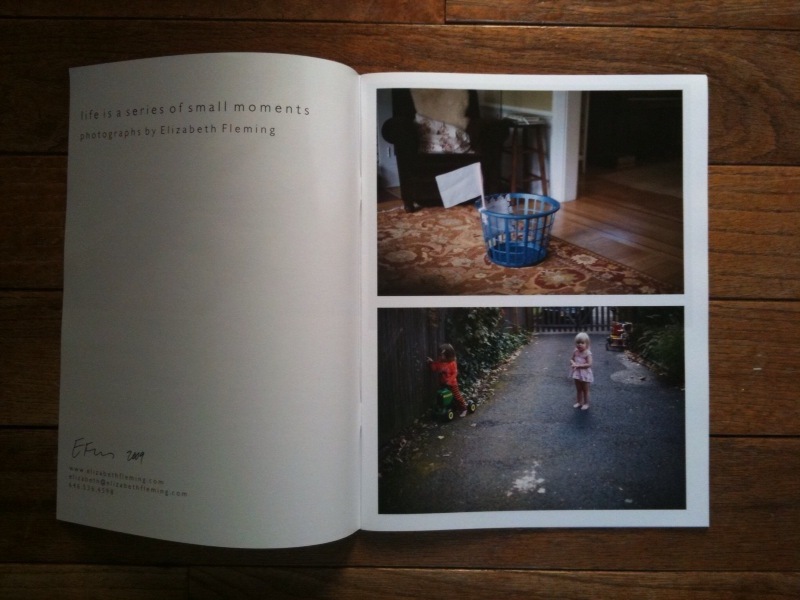 Elizabeth’s Blurb book was selected as an Honorable Mention in the 2009 Photography.Book.Now competition. To purchase the book from the Blurb bookstore click here. Both can be purchased from Elizabeth’s blog. You are currently reading Interview: Elizabeth Fleming at Larissa Leclair.